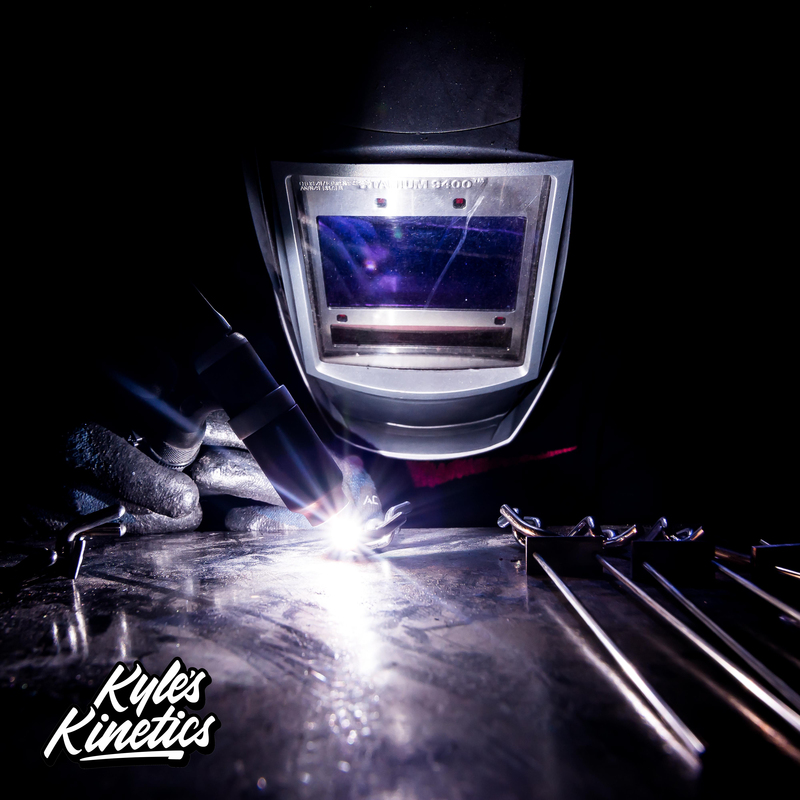 This week, we’re interviewing welder, metalworker, and sculptor Kyle Auga of Kyle's Kinetics in Phoenix, Arizona. Kyle created his first stainless steel balancing sculpture after a long session of trial and error, but now he makes a line of signature sculptures as well as one-off designs using the metalworking skills he's developed. Kyle uses raw metal, welders, grinders, and torches to create his unique pieces entirely by hand. 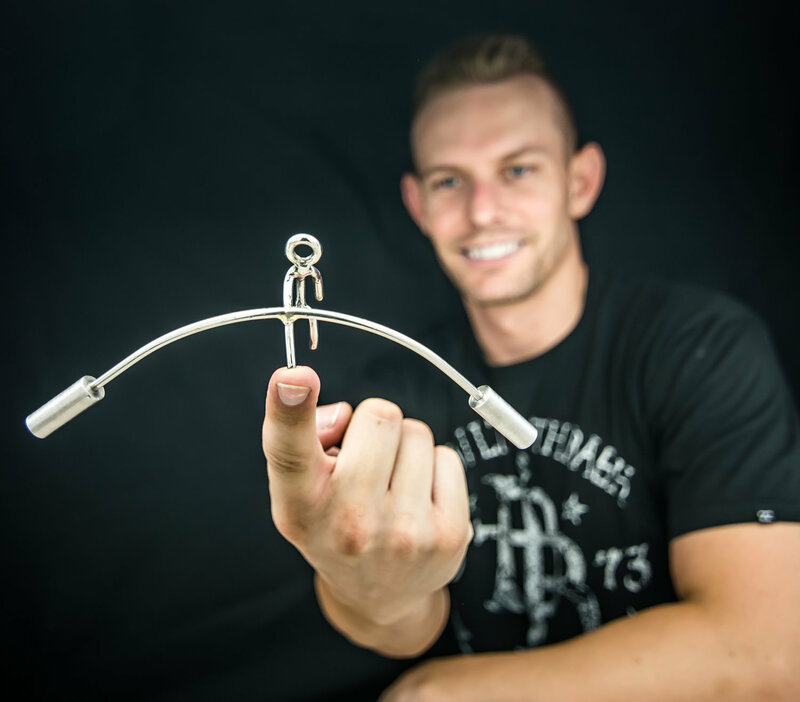 If your brand sells to metalworkers, this 1-on-1 interview with Kyle will give you important insights into connecting with makers like him. My name's Kyle Auga. 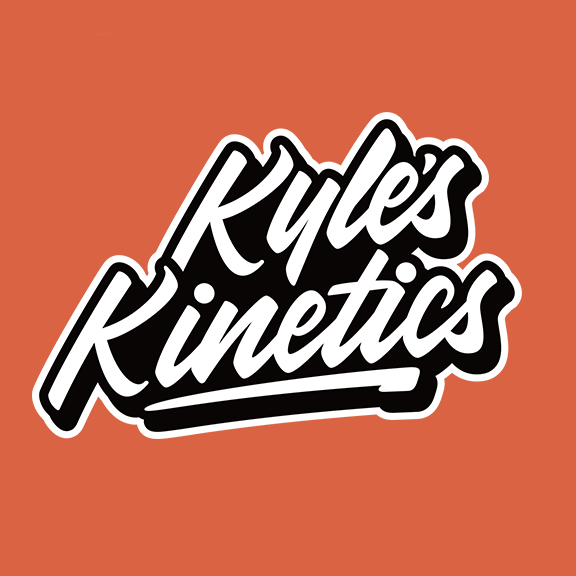 I'm the owner and creator of Kyle's Kinetics. I create handmade balancing sculptures, usually from TIG welding and stainless steel. I do everything by hand from start to finish. I usually start from a bar stock, and I use grinding and welding, of course, and I polish everything to a shine, and every single sculpture has to be balanced by hand individually. Even if make the same 10 sculptures over and over, they all balance a little bit differently. These things have been around for quite some time. They've been around, started back in the '70s and '80s, you could see some old-time welders, they would kind of take some scrap metal and put some stuff together and they'd make these fun little things, but there's other designs out there that existed that are old, so I'm definitely not the creator of the whole balancing sculpture thing. I just kind of made my own thing of it, and I've probably made more than any other individual has made by hand and I just, I had such a passion for the little balancing thing that I just kind of took it and made it my own. When did you start getting into the balancing sculptures? I think it's coming up on six years now. I was finishing my last year at Arizona State, and I was always studying at the desk when I was in school there, and I wanted something just to keep at the desk. I was just kind of bored one day between studying and I remembered, "Oh, those little balancing toys. I wonder if those are still around," and sure enough, I found the cheap Chinese ones that I had as a kid. They were just fun little toys, and I was like, “I wonder if anyone out there makes these things bigger or better, and like, these things are so cool, why not?" And no one made them. Nobody made them like that, and so I was like, "There's got to be a way to do this." I went to Home Depot and I had no money, so I bought a bare bones hacksaw, a cheap little vise, and a little propane torch and some solder, and that was literally all I had. I cut through a huge piece of half-inch steel bar stock that I used for the counterweights. I think the first one I made took me 12 hours, if I remember right, and I just sat there with the hacksaw, with hand files, and I wasn't sure what I was making. I made this little stick guy from a steel rod and I'm like, "Okay, I got the stick guy. Now how do I do this?" All these little toys have something in common. They all have some kind of counterweight. I'm like, "Okay, I'm going to make this bar," and then I put it on his hand, and it didn't work. Bent it some more, didn't work. Kept bending it, still wasn't working, I'm like, "There must be some magic to this or something. I'm just not getting it." So I stopped and I went back out to the garage and I'm like, "All right, I'm going to try this one more time." Kept bending it, and I just bent it a lot more, and all of the sudden, it stood up. It stood up on its own, and then from there, I was just completely hooked. How did you learn to work with metal? The first thing I googled was, "How to cut metal.” So yeah, I hadn't worked a whole lot with metal before then. I'd done some mechanical stuff, but not actually working and manipulating metal itself, you know? What helped me learn was tons of internet, tons of YouTube. Internet's your best friend as far as learning stuff these days, so I was very fortunate that I started doing this when I did. I mean, 10 or 20 years ago, the YouTube content wouldn't have existed. It's crazy how I, in some sense, was self-taught, but I had others over the internet helping, people on forums and stuff. I actually met an artist on one of the welding forums, his name's Kevin Caron, and he's an awesome metal artist here in Phoenix. He's got a larger reputation than I do. He's got stuff in museums, in schools, in city public places. It's really cool what he does. So he actually, he was like, "Hey, if you're in Phoenix, why don't you come down to my studio?" So I went down to his place and he gave me an hour lesson, and then I found his YouTube channel, and he's got tons of videos on everything metalworking. I really have him to thank a lot as far as teaching me over YouTube, and it was really cool to get to meet him. So besides the YouTube videos, just trial and error, lots of just time and just messing around with stuff. What kinds of videos and topics were you looking up? There was definitely no balancing sculpture tutorial or anything like that. It was just general metalworking, because as soon as I made that one balance, I'm like, "Oh, now I've got tons of ideas," and I slowly started increasing my tools. All the balancing aspect of everything, that was all trial and error. It's general metalworking that I learned from other people, and then I used that to make my own stuff and the balancing stuff was just purely my own time and just experimentation, trial and error, just crazy amounts of time figuring it out. What kind of steps would it take to get from your idea to a finished sculpture? I actually make a lot of custom and one-offs, and I also make a lot that I repeat over and over. Even though I repeat them, though, they're all unique in their own way. If I made the same 10 sculptures, but each one, even though it's the same design, will balance just a little bit differently because everything's done by hand. But making something custom or one-off, actually a lot of people ask if I draw things out. I really just don't. I just kind of see it in my head and then most of the time, the planning process with making something custom is, "Okay, how am I going to cut this? Oh, I know. I'll weld it like this," and so I'm kind of mapping out how I'll do it, not what it'll look like. As far as custom stuff, each process is different, I suppose. Whenever I make something new, it's usually something I've never made before, and so it changes every time. I actually learn something every time I make something new, and that's where I want to go eventually. I want to just make one-offs and custom stuff without ever having to make the same one ever again, because that's what I really enjoy, is making new stuff. Do you enjoy the challenge of figuring out how it's going to work? Yeah, it's a lot more engaging when I'm making something new, I'm like, "Oh wow, this looks cool," and as I'm building it, it comes together and looks better and better every minute that I keep working on it. But then someone says, "Hey, that one that you made a few months ago, can you make that again?" And I kind of don't want to, but as far as demand and everything, it's hard to say no and I love these things so much, that I figure out ways to make them over again and make them better. What material do you use to make your sculptures? It's all stainless steel. I buy it in bulk, generally from great company called Industrial Metal Supply. I buy some stuff online, some hard to find metals like tubes and pipes that are just kind of weird, that most people don't carry, I'll find online. But for the most part, Industrial Metal Supply is where I go to get everything in person. I get to go in there and it's honestly like a candy store for me. I walk in there and I'll see so many different shapes of metal and stuff, like, "Oh, I could ... What could I use with this?" I swear, I'll stand there for 10 minutes looking at some piece of metal I'm holding in my hand thinking there's got to be something I can do with it. But I'll usually end up buying it, it'll sit in the drawer for a few months, and then all of the sudden, I'm like, "Hey, I remember, I've got that thing. I could use that for this idea that I have." What made you choose the kind of steel that you use? So there's a difference between mild steel and stainless steel, but the reason why I choose steel in general is just because it's the most common thing to weld, it's easier to weld than aluminum, and most tools are geared toward cutting things out of steel. I actually started very briefly making things out of mild steel, which is a common rustable steel that has carbon in it, and then I switched to stainless steel because I wanted these things to last forever. I never wanted them to rust. I wanted you to keep them for hopefully a lifetime. What kinds of tools do you need for welding? For welding, the way I do it, I use a TIG welder. There are a couple different types of welding you can do. You can do stick welding, MIG welding, oxy-acetylene welding, or like I said, what I use is TIG welding. So you definitely need grinders to shape and clean the metal, and then you absolutely need a TIG welder to blend and melt all the metal together, essentially. TIG is a general term. It stands for tungsten inert gas. So there's a tungsten tip that comes out of the welder, the tip of the torch that I hold, and that tiny little tungsten tip is sharp and it allows me to manipulate what we call the arc, and the tip of the arc is what actually melts the steel. Do you have favored tool brands that you always go back to when you're going to buy those? So my tools for the most part, each one that I buy is pretty unique. So certain brands will make a lot of the tools that I need, but most of the time when I buy a new tool, it's usually a totally different brand. So there's not a particular brand. I have four grinders and they're all Makita, just because Makita lasts forever and they're fantastic. Welder brands, there's just a lot of brands out there. The brand of my welder is an AHP, but that's a very basic welder anyone can get their hands on. Everlast makes great welders. So it just depends on what your needs are. What’s your criteria for determining which tool you’ll buy or use? It's definitely a combination of things. You can have things cheap and fast, or you can have them not cheap and good. Right? You can't have it all. So I'm definitely trying to always find the balance between the two, of something I can afford, but something that I know will last me a long time that I can actually use and make things with. I prefer high quality tools for sure, but those tend to take time to acquire, for sure. Google's definitely my first step, and there are a couple sites like Amazon that will carry some basic tools. Then for more specific tools, you can go to Zoro. They have a plethora of tools and they carry all sort of brands and then you can kind of whittle it down from there, say Okay, there's X, Y, and Z brand and they carry X, Y, and Z tool, and then I can start to figure out what it is that's best. Do product ratings and reviews influence your purchase decisions? Absolutely. If I look at a tool and I'm like, "Okay, I think this one's a good one. Let's go see what YouTube has to say about it," 9 times out of 10, someone's reviewed it on YouTube and that's huge influencer for me, absolutely. The people that are generally using these tools, they probably have a different end result of what they want, but we're all doing the same thing, right? We're all either cutting the metal or welding the metal or grinding it. So yeah, for sure, and if it's someone random on YouTube, I might take that with a grain of salt versus someone like I mentioned, like Kevin Caron, if he recommends a tool, that's a lot more valuable to me. How else do you research new products? Facebook and Instagram. Like for example, Everlast Welders, they're on Instagram and I follow them on Instagram and I've seen when they come out with new welders. I'll message them on there and I'll ask them things. What brands do you follow on social media? As far as brands, the only real ones that I follow as far as a business I think are Makita and Everlast. I don't have any Walter Surface Technologies tools, but I would love to have a couple of their grinders. I do follow them, but like I said, I don't have any of their tools yet. A lot of the time, those companies, they'll post interesting things. They'll post some welds or metalwork or, ”Hey, we've got a new type of abrasive wheel," and I'm like, "Oh, that's got a nice finish.” That Walter company that I mentioned, they have really nice finishing wheels, and they are pricey, but like I said earlier, you get what you pay for as far as tools. So Walter makes a good product, I just haven't been able to get it yet. Do you also follow other metalworkers, other welders, other makers of different kinds? Oh, tons. Yeah, I think most of the people I follow on Instagram are all other metal artists. They make stuff that's above and beyond what I can make. I follow Kevin, of course; a guy named Jamie Schena — he makes incredible metal and steel car models, and his work is just phenomenal. A lot of welder artists out there that are just so cool, and they're a huge inspiration for me. Do you reach out to those artists if you have a question about metalworking? All the time. All the time. There's one guy in particular, his name's Brian, and his business name is Steel Life Metal. He and I actually talk quite a lot. We became friends over Instagram, and his welding ability is way above and beyond mine, and there are several other guys that I'll talk to, I'll say, "Hey, how did you do this? What would you recommend for me to weld something like this?" So the welding art community, though it's not huge, it seems big to me because I'm surrounded by it, but I think most people don't recognize just how tight-knit it is. There are actually quite a few really amazing welding artists out there, and everyone talks to each other and we're all willing to talk about it and help each other weld. Are you active on any other social media platforms or forums? Not as active as I probably should be on the forums, because the welds I do are really unique, and I should probably share some of the stuff I've done because most people don't do the welds that I would do. But I would say for the most part, just Instagram. I really am not huge on Facebook. I have a few followers on Facebook, but don't really interact there as much as I do on Instagram. I do have YouTube, where I post more dramatic and more professional and consistent videos of each sculpture that I make. Especially the unique ones, I'll post on YouTube and make a nice video of it. But eventually, I would like to have a bigger presence on YouTube. I'd love to share videos and start teaching people and showing people how I do welds especially because they're so unique, and I figured some things out that most day-to-day fabricating welders wouldn't think to do. Where else do you get inspiration for new sculptures? A lot of it actually comes from Instagram. Actually, even from movies. For example, I love Tim Burton movies quite a lot, really love his style. He's a unique director and artist, and he sees things a bit differently, and so I actually made a sculpture that was kind of based off of his work and his kind of really tall characters. So I made something that was really tall and long limbs and it didn't really make any sense, and it was kind of dark and somewhat eerie, and it was exactly like what I think Tim Burton would do, and so I definitely got inspiration from that. What kind of time do you devote to your projects? Do you have a team to help you? It's all me, 100% me. 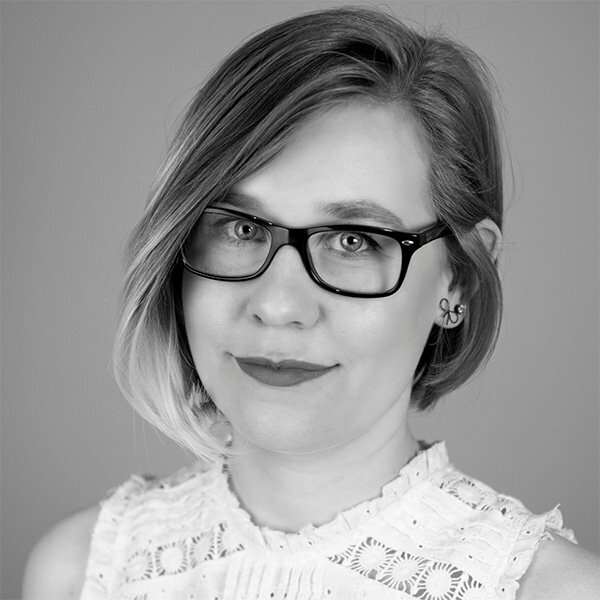 The pictures on my website I've professionally taken myself. I taught myself photography, lighting. I take the videos myself, I edit myself, I built my website myself. The only thing that I didn't do technically myself is my logo. I found an artist to help me with that. But absolutely everything else is yeah, I do everything. I've done this full time for almost three years now, and I'm kind of getting away from doing this full time though. Just recently, over the last eight months or so, I actually started flight school. I'm a pilot now, and I'm going to continue doing this stuff because I love it, but when I was doing it full time, it just wore me down and the creative part of it just got lost. I was just fulfilling orders and it just wasn't realistic for me to do it forever, and I kind of lost the love of welding from doing it so much. But since I started flight school, I miss welding again, and so I think that passion is back as far as welding, and so that's where I want to be. How much time would you say you spend on an average sculpture? They are all different. Some custom stuff or one-offs can take me days. Ones that I can repeat can just take a couple hours. But yeah, I would say on average, a few hours for sure, for even the most common ones. How do you manage your time on social media and business admin with your time spent actually welding? I've only made two videos, like time lapse videos, on YouTube of me working and making a sculpture from start to finish, and just recording with a camera in the same place with nothing else, it takes a bit of effort. You have to have the gear, you have to have the space, the lighting, and you have to constantly baby the camera and make sure you're not grinding into it, that the battery's still there. So it takes a lot of work, and then once it's recorded, you actually have to edit it quite a lot to make it look good, smooth, and interesting. Like I said, I do everything myself, so I handle emails and customer questions, sales and everything, I have to ship them, box everything up, I have to print a label. Any shipping problems that might occur, any other questions that people might have, I have to deal with all of that. So yeah, it takes a ton of time, and it's just I haven't had a whole lot of time. Between this year of welding so much and flying a lot now, I just haven't had time to ramp up YouTube like I'd like to. But eventually, I'm sure I will. Do you have a favorite sculpture you've ever made? Yeah, actually. Yes. I've made quite a few, but it always comes back to the one-offs. I think my favorite one is something I made most recently. It seems like every time I advance, it's always, "Oh, this one's my favorite now. Oh no, this one's the best one I've ever made,” because I get better continually. But the one that I think is my favorite currently is the Tim Burton one called Agony, and it actually sold really fast. I posted it on Instagram and said, "Hey, it's available on the website if anyone's interested," and it sold within 10 minutes. It was totally black steel and gritty, and it's just kind of weird and odd. I honestly had no idea what I was making while I was making it. It just kind of happened, and that was the most fun process, is when I can do something like that, when I don't have to think about it much and it just, something unique comes out of it. So definitely that one's my favorite. That's art, right? I think that's how it's supposed to happen. Absolutely. Exactly. It's supposed to be very fluid. It's supposed to just, without any real reason, it's just supposed to come about and it finds some meaning to somebody, and that's exactly what happened. I was really proud of that one. What makes you most proud to do what you do? It's just the finishing of something new, something I can sit there and watch balance and I can just look at the details and go, "How did I make that? I can't believe I made that." So every time I make something better, that's what the most rewarding part is. I can't believe I actually made something that I kind of had a vision of, and there it is now in front of me, and somehow, I did that. It's almost like there's a different part of me making it and then a different part of me actually observing it when it's done, and that, I think, is the most satisfying part, is just sitting there looking at a sculpture balancing when it's all done. What happens when you run into a problem or challenge during a project? Oh, that happens all the time. I've got a whole drawer full of scrapped ideas or things that I couldn't quite put together, that didn't look right or didn't balance right. I've converted a couple sculptures into stationary sculptures. For example, I made a little Schwinn bike, just because I thought making the little bike sculpture was a fun process, and I had planned on making it balance, but it ended up being a little bit too big, though I did enjoy making it. So it ended up just being a stationary sculpture, and that was one of the ways I overcame that. I just turned it into something else. A lot of the time, I've got to scrap ideas. They just don't really work out quite right. I may or may not be able to be like, "Okay, well, this is too small or too big. Maybe I can add this to a different sculpture or maybe I could convert it to a sculpture on its own.” Most of the time, it just sits in the drawer, unfortunately, waiting for something to be done with it. Yeah, so I'm really trying to move toward big sculptures. I've always envisioned these things to be desk sculptures for anywhere from kids and executives, lawyers, business owners. I've actually sold them to all sorts of people, but that's what I've always envisioned. They could be for anybody, but I want to kind of get away from the desk thing and go toward something a lot bigger. One of my other favorite designs is called an Ocean Buoy, and there are a lot of reasons why that's my favorite. I could rant about that one, but I'm actually trying to make that a 30 or 40 pound sculpture that sits on the ground and you can walk up to it and you take your whole hand and tilt the thing and you just watch it bob and move on the ground. Is that a bigger scale than you've ever done before? Yeah, so I've got part of it done right now. It's, I don't know, probably a tenth of the way done, but it takes a lot longer. But I'm starting to get an idea of how big it's going to be, and it's definitely the biggest thing I've made so far. I hope it works out, because like I said, you never really know how it's going to behave. I just have to start making it in order to know if it's going to work or not. So it could be a lot of work down the drain, it could be a big learning experience, or it could work out hopefully exactly as I imagined. I never would've imagined that I'd do something like this full time. It was a very weird hobby that I had for a little while, and then the first one I sold years ago sold for just a few bucks to get it out of the house, and it's turned into something bigger and my abilities have surpassed anything I could ever imagine that I could be good enough at doing. But with enough time and just drive, it's just kind of happened, and I love watching these things balance, I love making these things.